Despite President Bush's promise of universal access to broadband by 2007 there are still areas within the US that have little or no coverage, according to DSLReports.com. In the UK, broadband has become cheaper than dial-up access according to Silicon.com. 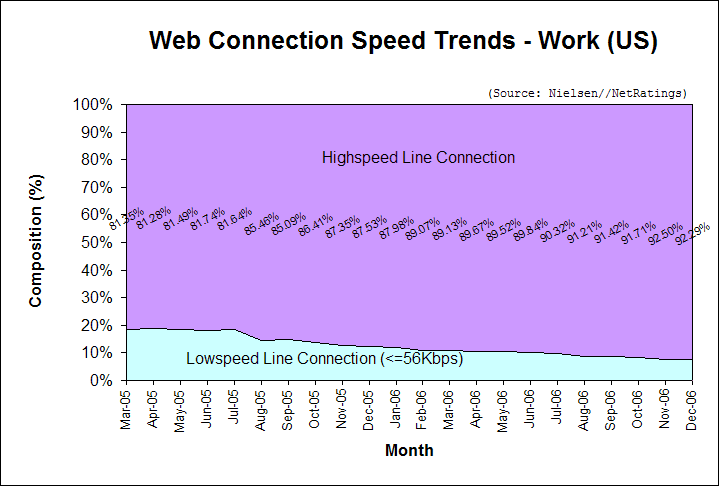 Meanwhile in the US broadband grew to 78.5% in December among active Internet users. US broadband penetration among active Internet users grew to 78.45% in December 2006. Narrowband users connecting at 56Kbps or less now comprise 21.55% of active Internet users, down 0.77 percentage points from 22.32% in November 2006 (see Figure 1). 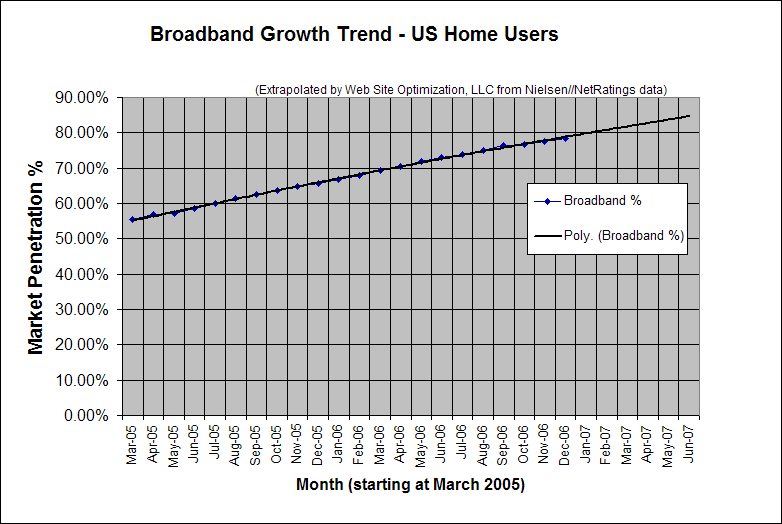 In December 2006, broadband penetration in US homes grew 0.77 percentage points to 78.45%, up from 77.68% in November. This increase of 0.77 points is below the average increase in broadband of 0.99 points per month over the last six months (see Figure 2). 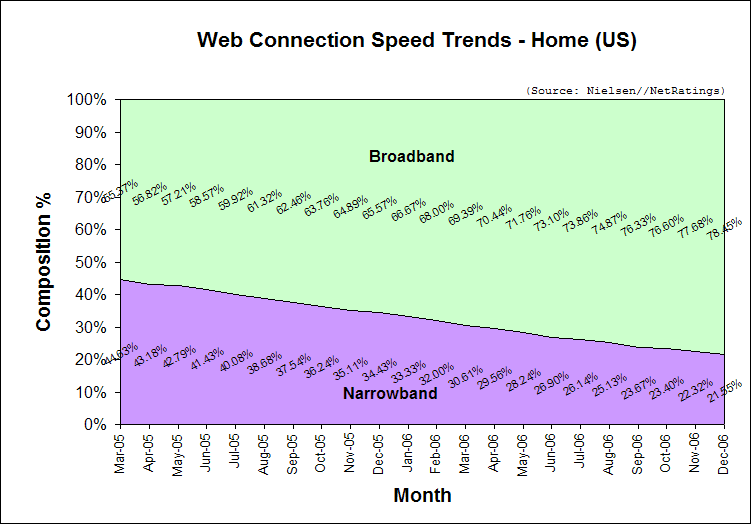 At current growth rates US broadband penetration should break 80% among active Internet users by February 2007. As of December 2006, 92.29% of US workers were on broadband, down 0.21 percentage points from the 92.5% share in November. At work 7.71% connect at 56Kbps or less (see Figure 3). DSLReports reports that there are areas within the United States that have little or no broadband coverage. One reader reports on an area in Virginia near a mountain that lacks even satellite access. DSLReports.com, Jan. 20, 2007. 'According to price comparison website SimplySwitch.com, unlimited dial-up packages have become more expensive than the same packages on broadband for the first time as narrowband is being "priced out of the market."' Silicon.com, Jan. 18, 2007. Provided the streaming media player data and US broadband penetration data for active Internet users for the Bandwidth Report.